The Crew are continually coming up with new ideas that keep them quite busy and entertained. They really do have wild imaginations and want to share them on the Kool Kids Crafts website. Our blog keeps kids, parents, and teachers updated on seasonal crafts, information on our craft workshops, and what new crafts are becoming the craze. 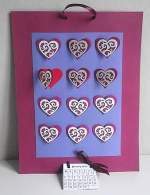 What`s more, you will enjoy the quality time as a family or as friends together making all sorts of creative fun stuff! So, what next? Click on that little orange RSS button to subscribe. Leaf Art Part2 teaches children how to add depth to an Autumn still life pastel drawing. The picture tutorial shows each step to complete it. Continue reading "Leaf Art Part2 Kids Crafts"
A giraffe crafts tutorial for children to create at home, or for a school project. Age groups for this activity range from 6 to 10 years. 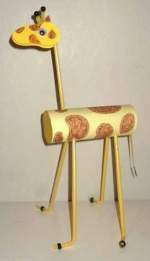 Continue reading "Giraffe Crafts for Kids"
Make your own calendar instead of buying a ready made one. The KKC crew have some inspiring projects that will motivate you to create eye-catching ones. Continue reading "Make Your Own Calendar Tutorial"
Make a kaleidoscope part3 will show you how to fix the beads to the end so that they turn freely and to finish off by decorating your masterpiece using paper punches. Continue reading "Make a kaleidoscope part3 Tutorial"
Make a kaleidoscope part2 is the next stage of this craft where we measure the angle for the mirrors and put them in place. Continue reading "Make a Kaleidoscope Part2 Tutorial"
How to make a kaleidoscope from cardboard tubes where the end rotates like the classic tin toy. This construction craft will suit children 9+ years of age which means adults can create one too. Continue reading "Make a Kaleidoscope From Carboard Tubes"
Making a leaf mobile for crafts during the Autumn season using card in various colours and cutouts from childrens drawings of leaves. Continue reading "Leaf Mobile For Autumn Crafts"
Homemade board games are easy to make. Once you create your first it will be easy to think up many variations and themes. Continue reading "Homemade Board Games For Kids Crafts"